Santa Claus Simulator allows (as the name suggests) to simulate the presence of Santa in your living room while your children are in another room. 1 - Send the child or children to a nearby room with an accomplice. 3 - When everything is ready, connect your iPhone to a speaker for a very powerful sound. 4 - Launch Santa Claus Simulator and press the buttons to make Santa talk and simulate his arrival, the gifts' setup, then his departure. 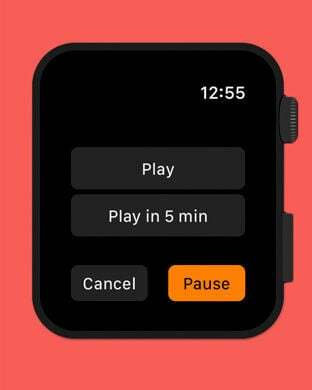 5 - Alternatively, use the sequence mode to prepare the sounds in advance and start playback after 5 minutes to be with your child when Santa arrives. 6 - Bring back the children, who will not believe their eyes to have missed Santa so close! Bonus - For an even more magical gift opening, press the Music Key and enjoy the joy in your children's eyes. Thanks to Santa Claus Simulator, the spirit of Christmas will be more true than ever, and Santa will no longer have the voice of uncle Bob or dad. Warning : If you use the timer mode, be cautious not to lock your iPhone, and that it won't lock itself after a while. Same thing if you are using the Apple Watch, don't lock or let the iPhone lock itself, otherwise the timer won't work.